The first step to effective mouse control is sanitation. When talking about mouse control, this means more than tidying the place up. It means systematically depriving mice of food, harborage, and nesting materials. Mouse droppings, spilled food, and nesting materials should be removed from areas where they are found. To avoid illness, this must be done very carefully. Mouse droppings and other by-products associated with mice may contain pathogens and parasites, so don't touch them with your bare hands. Use surgical gloves instead. If the droppings are heavy, use a surgical mask, as well. In addition, because pathogens are microscopic, you should never vacuum droppings and other contaminated items with an ordinary vacuum cleaner, as this will just cause the pathogens to become airborne. A HEPA vacuum cleaner would be acceptable, but on;y if you're absolutely sure it has a HEPA filtration system. Another solution is to spray the droppings and nesting material with a high-quality, non aerosol, pump-type disinfectant spray like Citrus II Hospital Germicide Spray, let them dry, and then remove them. You can also make a mixture of 12 parts water to 1 part household bleach and spray the mixture on the contaminated areas using a trigger-type spray bottle. Always wear rubber gloves and wash your hands carefully after working with either mouse by-products or chemicals. The next step in mouse control is exclusion. This means making structural changes such as caulking, sealing, or installing door sweeps to keep mice out of the building. Since mice can squeeze through any hole as big around as the average adult's little finger, or through a crack the width of a pencil, mouse exclusion can be a daunting job. But it is essential to long-term mouse control. There is no point to trapping mice inside your house without preventing new mice from coming in to replace them. I could go into great detail here about rodent exclusion; but seeing as how the U.S. National Parks Service has been kind enough to write an entire manual about it, I suggest you just click here to download it. It's an oldie, having been written in 1997; but I still think it's one of the best rodent-exclusion manuals ever written, so I keep it alive here. Whenever possible, I recommend trapping mice, rather than poisoning them. 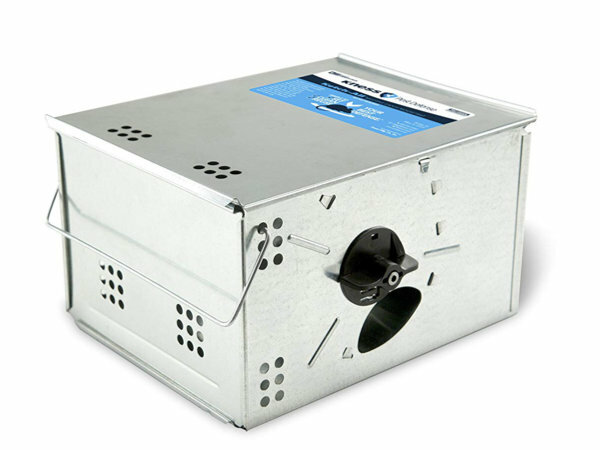 Trapping produces faster results and avoids the risks associated with chemical rodenticides. It also eliminates the risk of a poisoned mouse dying in a wall void or other inaccessible area and decaying there. Mice who die in areas from which they cannot be retrieved can cause odor problems and serve as a breeding area for flies. Their displaced ectoparasites will also look for new hosts, and may infest people or domestic animals. Individuals handling any rodent trap should wear rubber gloves and wash carefully with an anti-microbial soap after handling the traps. Here are some of the more common types of mousetraps in use today. The oldest and still the most commonly-used mouse trap is called a "snap trap." Commonly used baits include peanut butter, dried fruit, jelly beans, and gumdrops. (Contrary to popular belief, cheese is not a very good mouse bait.) Snap traps are inexpensive, effective when used properly, and humane. The trap shown here is a Victor snap trap. It's one of the oldest mouse traps on the market, and still one of the best. The one in the picture has the standard trigger. They also make models with expanded triggers that don't need to be baited, but also have a higher rate of triggering themselves due to vibrations from passing trucks and the like. What I suggest is that if you're placing traps in the house you live in, where you can check them frequently and keep the bait fresh, use the traps with the conventional triggers. But if you're setting traps in a place like a vacation home where the bait will get stale or rancid, use the expanded-trigger traps. Just use a bunch of them because some invariably will trigger themselves. Whether using bait or not, wear gloves when handling or baiting mouse traps. Human scent, as well as the scent of things we've handled, may repel mice. Also, if you're using bait, use only a tiny amount. A dab of peanut butter about half the size of a pea on a conventional-trigger mouse trap is plenty and will be more effective. A small dab forces the mouse to get its nose right up on the trigger. Snap traps should be placed perpendicular to a wall or vertical surface along mouse runways or areas where droppings have been found, with the trigger end against the wall as in this picture. Remember that mice don't see very well, so they tend to run along walls and other vertical surfaces. That's where you want to place the business end of the mouse trap. 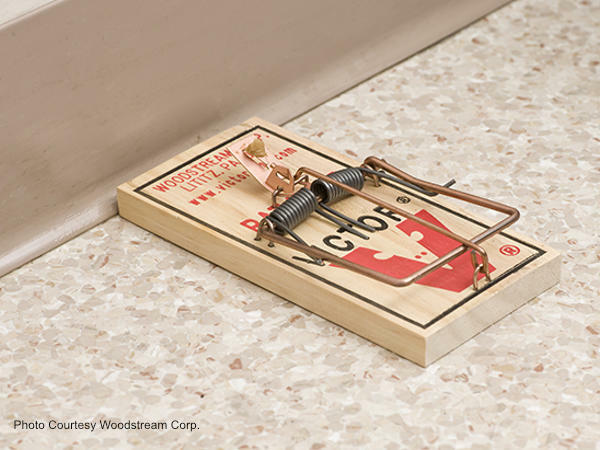 Multiple-catch mousetraps are a great way to trap mice in places that are usually unattended, such as a cabin or vacation home. They're also good for rapidly clearing up severe infestations. 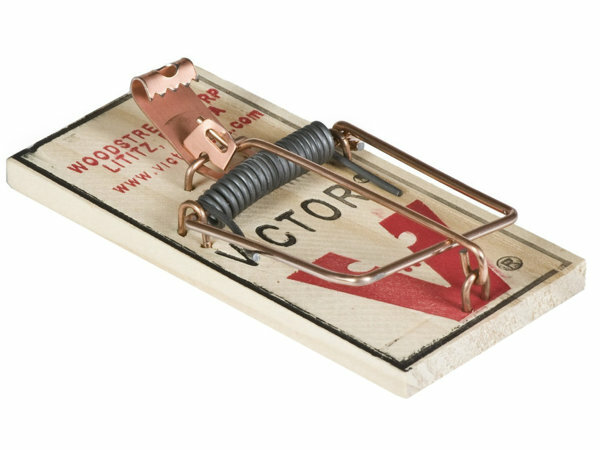 The trap shown here is the Kness 101-0-002 Ketch-All Mousetrap, which is the latest and greatest version of the trap that has been the favorite multiple-catch mouse trap of professional exterminators for generations. It's the one I personally use, and the one I recommend that you use. Multiple-catch mouse traps should never be baited. They work by appealing to a mouse's natural fondness for holes that they can fit through, but which are too small for cats and other predators to follow them through. The best way to set a Ketch-All trap is with one of the long edges (the sides that have the mouse holes) about two inches (about 5 cm) from the wall or other vertical surface the mice are traveling along. The mouse will come across the trap, see the hole, and walk in. It's that simple. Once they get inside, the mice will step on a pedal and be flipped into the holding chamber. Usually they are not injured in the process, but once in a while they are. You can either release them outside or leave them in the trap to die. There's also a drowning attachment available if you want to expedite their demise. 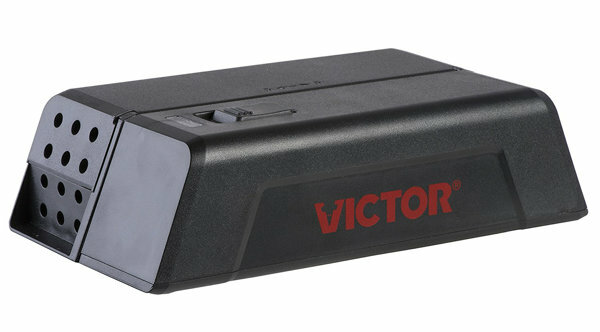 Electronic mouse traps, such as the Victor M250S trap shown here, are becoming increasingly popular. These traps typically can kill anywhere from a few dozen to a hundred mice on one set of fully-charged batteries. They use no chemicals, but some models use specially-formulated baits to attract the mice into the traps. The advantages of electronic mouse traps over the Ketch-All trap are that they can catch more mice, that disposal of the dead mice is easier, and that some people believe that electrocuting the mice may be more humane that allowing them to die long, slow deaths in the traps. The only real disadvantage to electronic traps is that in unheated locations in very cold places, alkaline batteries tend not to work very well. Lithium batteries of the proper size (usually AA, but check first to be sure) solve that problem. If I needed to trap mice in a place like a cabin, camp, or bungalow that I only visited a few times a year, I'd choose an electronic mouse trap and install a fresh set of lithium batteries every time I visited. Sticky traps are cardboard or plastic trays covered with a sticky glue. They are placed along mouse runways, and mice simply get stuck to them. Exterminators usually call them "glue boards." Glue boards are effective in dry, clean, room-temperature areas. Water or dust will render them useless. A mouse with wet feet can simply run across the glue. They also must be changed frequently, as accumulated dust and debris on the traps will render them ineffective. Although quite effective, many people (including myself) believe that glue traps are inhumane. In fact, they are illegal in some places. Trapped mice sometimes squeal helplessly for hours (or even days) before they die. The only time I use them is if I have a huge number of mice that I need to catch rapidly, and I'm able to check the traps frequently so I can humanely kill the mice rather than letting them suffer. At the opposite end of the extreme from glue boards we find humane mouse traps. 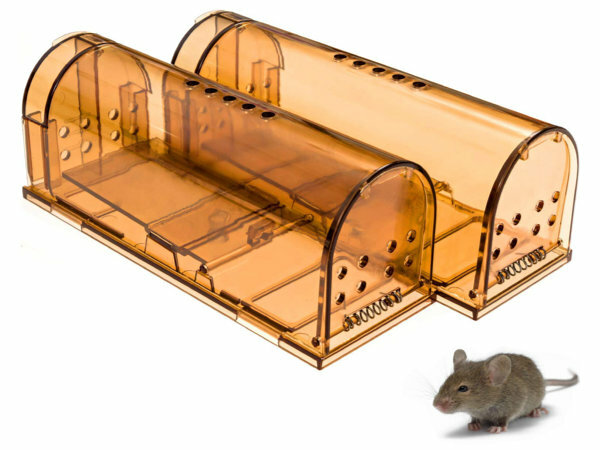 These traps are designed either to trap mice without harming them (no-kill traps, like the CaptSure 2019 trap shown here) so they can be released in the wild, or to kill them quickly and humanely. Humane mouse traps are a great option for those who feel bad about killing mice, but who nonetheless prefer not sharing their homes with them. Just release them outside and let them take their chances with the cats, foxes, skunks, and snakes. In some localities, however, releasing trapped mice may be illegal; so check your state and local laws. It would be very embarrassing having to explain to your cell mate that you're in jail for illegally releasing mice. Humane mouse traps need to be checked frequently, lest trapped mice starve to death in the traps, which would defeat the purpose of using a humane trap. Care also must be taken to protect yourself when handling the traps. Mice have ectoparasites that can cause disease. Wear surgical gloves and wash your hands thoroughly when you're done with your mission of mercy.